Perhaps you are the owner or property manager of a commercial or retail space with terrazzo floors that are subject to heavy traffic. It could be that you’ve had terrazzo floors for years and years, and you don’t want to replace them, but you’re really annoyed with the amount of time and effort needed to keep them looking decent, not to mention the money you spend on expensive stripping, cleaning, and waxing products. Maybe you are a homeowner surprised to discover terrazzo hidden under carpet or some other surface. Janitorial services, bless their hearts, often use coatings to achieve a beautiful shine. Unfortunately, improper restoration methods only lasts a short while, and ultimately end up doing more harm than good. Coatings become scratched and scuffed, and dirt, grime, and other contaminants become embedded in coatings, making the floor ugly and unsanitary. To keep the floor looking decent, the coatings have to be completely removed and replaced as often as every three months. Sometimes the coatings are not completely removed, and with each passing strip-and-wax, the floor gets a new layer of yuck. If your terrazzo was hidden under carpet or some other surface, it is likely damaged with holes from carpet tacks or nails, deep scratches, ugly stains, unsightly cracks and chips, and other damage. Don’t cover your terrazzo again. Let TECHSTONE’s highly trained technicians amaze you with their mad terrazzo skills. 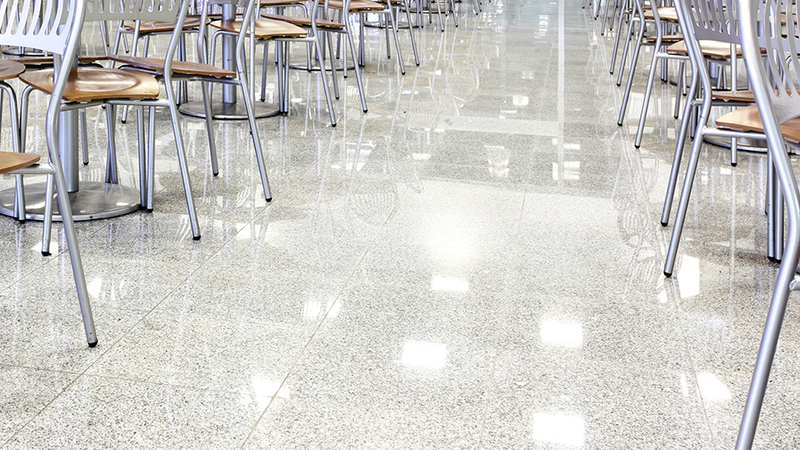 When properly repaired and restored, terrazzo is an incredibly resilient type of flooring for homes, apartments, restaurants, stores, hotels, hospitals, schools, and busy office environments. TECHSTONE provides expert terrazzo repair services. We can use tinted filler to fill in chips and cracks, or filler with aggregates (little pieces of marble) that match your terrazzo, and the hone or polish it smooth to blend with the surrounding finish. TECHSTONE provides expert terrazzo restoration services. We can hone away the scuffed and scratched surface layer to reveal the brand new stone underneath, and then polish your terrazzo to a beautiful shine, providing the finish of your choice — a velvety smooth satin/matte finish or a glossy, elegant polished finish. We can also apply an impregnating sealer to help inhibit stains. With our regularly scheduled maintenance program, your floors can look great all the time, without the need for periodic restoration. For a free estimate on terrazzo cleaning and sealing, honing, refinishing, repair, polishing and other terrazzo restoration services, use our online contact form or call (888) 570-2859 today.